I've lost count of how many times I have said this but I really love the combination of long sleeves with skirts and/or shorts. It's nice on cool summer mornings and evenings as well as chilly autumn days. I tried this look a couple of weeks ago and really liked it so I decided to give it another go. It's an unexpected pairing, a loose sweater worn over a skirt but I think it strikes a nice balance between being more dressed up and casual. Casually dressed up. Last week I went to Madewell looking for this skirt (sadly they didn't have it) and came home with this sweater, which just so happened to be on sale for an additional 30% off. Score! I've had this skirt for a couple of years, but haven't really worn it much as I distinctly remember JD informing me that he wasn't a fan of the faux leather accent around the bottom. If I recall correctly the exact word was "costume-y". What better time to break it out than Halloween? I kept my accessories simple and paired with a black handbag and boots. Speaking of... I have gotten a lot of questions about my bag so I figured I may as well write up a little review of sorts, my feelings on it. I was first introduced to Cuyana by Katie of Lovely Letters. It was love at first sight and I had since been debating whether or not to get this bag. Obviously I went for it. I have been looking for a new black crossbody handbag for years, so this is a pretty big deal. This one is sturdy and well made, smells like leather (in a good way), and is big enough to hold all of the essentials (if you're curious to see what I keep in my handbag click here) without losing anything in it. I think we've all been there, when the insides of our handbags come to resemble black holes. I have actually lost one necklace and one earring in two separate bags. Worst part is I actually checked them to see if those missing jewels were in fact inside and came up empty handed with both. It wasn't until weeks/months later when I was looking for something else that I found both of them. I'm kind of embarrassed to say how long I had been looking for that pearl earring. I actually bought a new pair. That's how long it was. Getting back on track. The strap is long enough to wear as a crossbody, but not too long that you couldn't just sling it over your shoulder and go. You could also probably tuck the strap in and carry it as a clutch in the evening. There are plenty of pockets that will fit larger phones and keep things separated. I have been really very happy with it so far, especially the price. you can't beat it for the quality. Shipping was fast and free! I'm seriously considering scooping up this sweater dress. So there you have it. Happy Monday, hope you had a great weekend! LOVE this look girl! I think the leather accent is fun, not costume-y at all! And your bag is definitely gorgeous! You look gorgeous! That skirt is stunning!! I wouldn't say the skirt is costumey, I love the leather detail! LOVE The skirt! No need to wait for Halloween, girl! I love this skirt with the leather detail! Classic with an edge. And that Cuyana handbag is the perfect investment! I am seriously crushing on your skirt! I love the little leather details!! Such a great look! I really love this sweater and skirt combo!! And I think the faux leather detail is fab!! I'm glad you did a review of your bag - I'm always drawn to how beautiful and classic it is! Long sleeves and skirts/shorts is also a combination that I love! 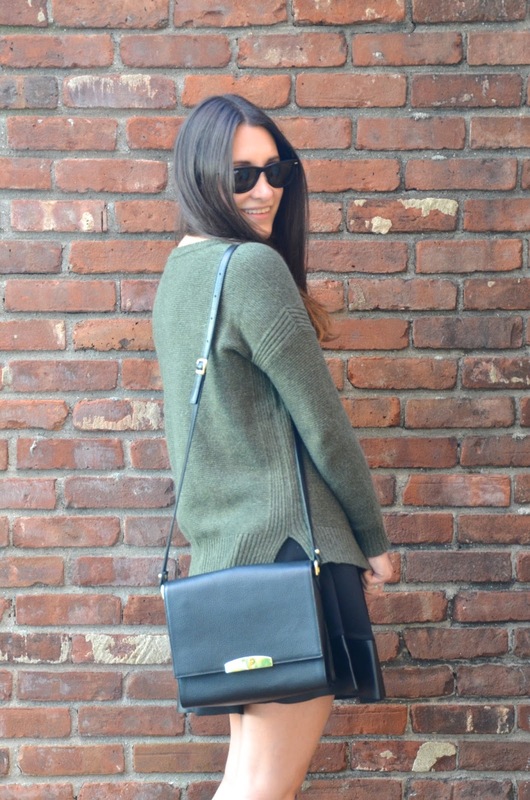 This is a perfect fall look and that bag is pretty stunning too. Really love the bag !!! Such a cute look too. What a great skirt. Classic skater skirt in basic black but with an updated accent, the trim. Really cute. Great piece. Ha- maybe I could see where he was coming from but this is actually one of my favorite outfits of yours- I love it!! I saw a picture you posted on instagram of NYC and it was so crazy beautiful, sometimes I forget you live there, you lucky lady. It looks so beautiful right now! I love when you stumble into Madewell and they are having a random sale, and I don't think your skir tlooks costume-y at all, haha, boys! Love that skirt! I think the leather band at the bottom is fantastic! And the sweater is fab. So, I originally seen this bag on your insty and decided to check out your review on it, and you've made me one to go snag one of my own lol. I find the burgundy one just as lovely, hopefully they restock it soon because it would be perfect for fall. Oh btw, the sweater and skirt look great together!! So happy you pulled the trigger on a Cuyana bag! I'm wearing my cape of theirs today and am thrilled to have stumbled on your review while wearing it! Cuyana is obviously calling to me... I'll be at their holiday party on Thursday and might take this all as a sign to pick out a new item.